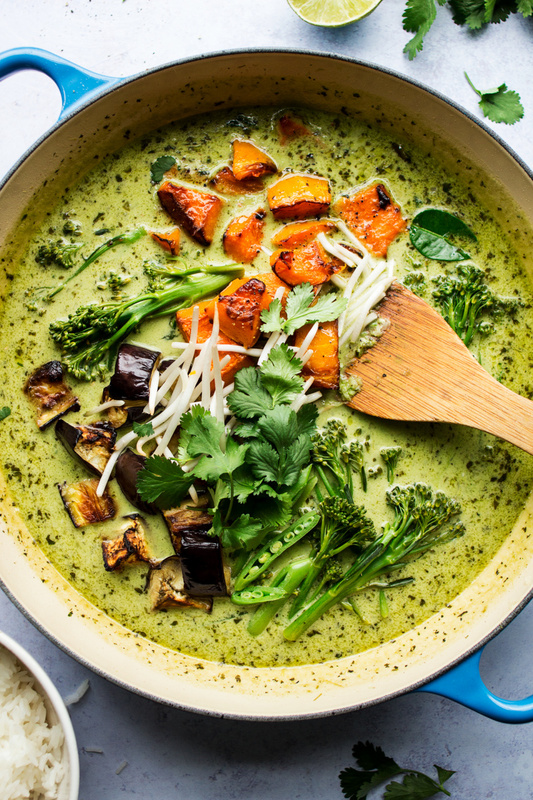 As it is for many people, Thai green curry was my introduction to Thai cuisine and it’s still one of my firm favourites. 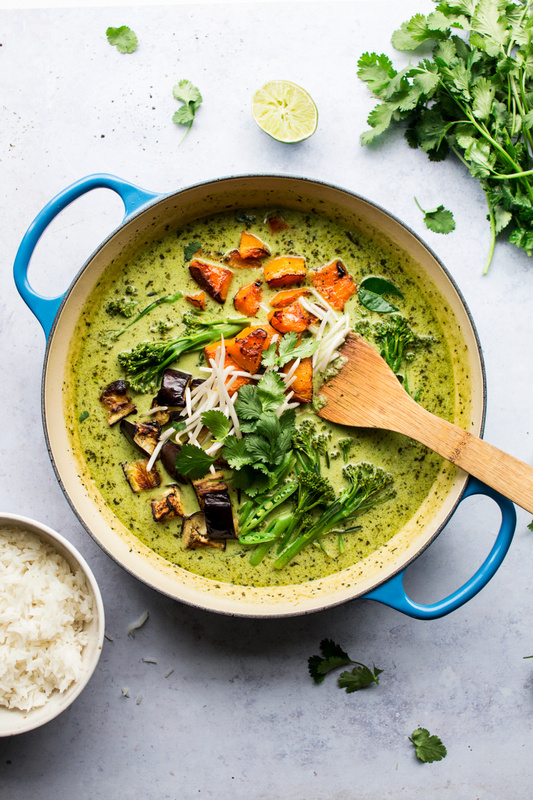 This comparatively mild and herbaceous curry is a Thai restaurant menu staple for a reason – you’ll be hard pressed to find anyone who doesn’t like its gorgeous, well rounded flavours – spiciness soothed by cooling coconut and set against the freshness of coriander, lemongrass and lime leaves. The last two blew my mind the first time I tasted them and I have been hooked on their unique flavours ever since. When we lived in London, going out for Thai food was probably a bi-weekly ritual and it’s something I am keen to resume here in Bristol (as you can imagine, there wasn’t any decent Thai food to be had on Paros, where we lived before moving back to the UK). Being vegan complicates things slightly as shrimp paste and fish sauce are such essential Thai ingredients that often people forget that they render a veggie-packed dish not suitable for either vegans or even vegetarians. Well, once we move house, I will be on a mission to find a good Thai restaurant that is willing to tweak things a little if we ask nicely and you’ll know if I succeed, as hardly anything gets me as excited as finding a new favourite place to eat. Meanwhile, here is my take on Thai green curry. 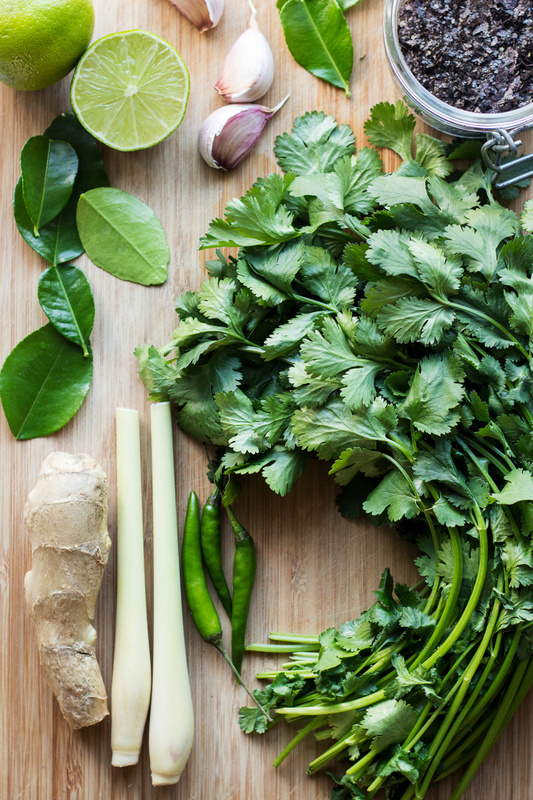 I’ve had trouble finding fish-less green curry paste so I’ve decided to make my own, especially that things like lemongrass or lime leaves are now fairly easy to get hold of – they can both be found in large supermarkets (although I prefer to get them from the Asian store in town). I make my own fish sauce (I promise to share the recipe with you at some point) and you can buy it online too but if you don’t have any to hand, adding ground up nori seaweed to the paste imparts a ‘fishy’ taste without harming a thing. I grind the sheets in my spice grinder and keep them in an air sealed jar on my shelf until they are summoned to help out in the flavour department 😛 . PS: If you make my vegan Thai green curry, don’t forget to tag me on Instagram as @lazycatkitchen and use the #lazycatkitchen hashtag. I love seeing your takes on my recipes! 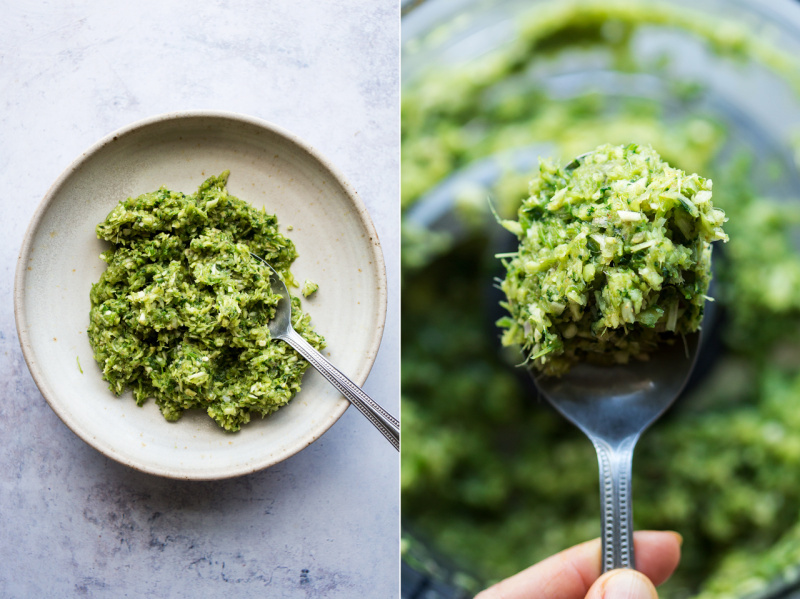 In a food processor, combine all the paste ingredients until finely chopped. Heat up oil in a heavy-bottomed casserole dish on a low heat. Add curry paste to the hot oil and fry it off gently, for 10 minutes, stirring the entire time. Stir in coconut milk (you can use low-fat coconut milk if you want the curry to be skinnier). Finally add in the lime leaves and stock (or water). Start off with 360 ml / 1½ cups of stock and add more to achieve the desired consistency. Traditionally this curry sauce is fairly thin and soupy in consistency. Allow the sauce to come to a gentle simmer. Simmer for 10-15 minutes on a low heat. Season with tamari (soy sauce or vegan fish sauce), lime juice and a touch of sugar (if needed). If you can, allow the curry flavours to develop overnight as it always tastes better the day after it has been made. If you are making this dish a day in advance, I recommend not cooking the vegetables until just before serving. 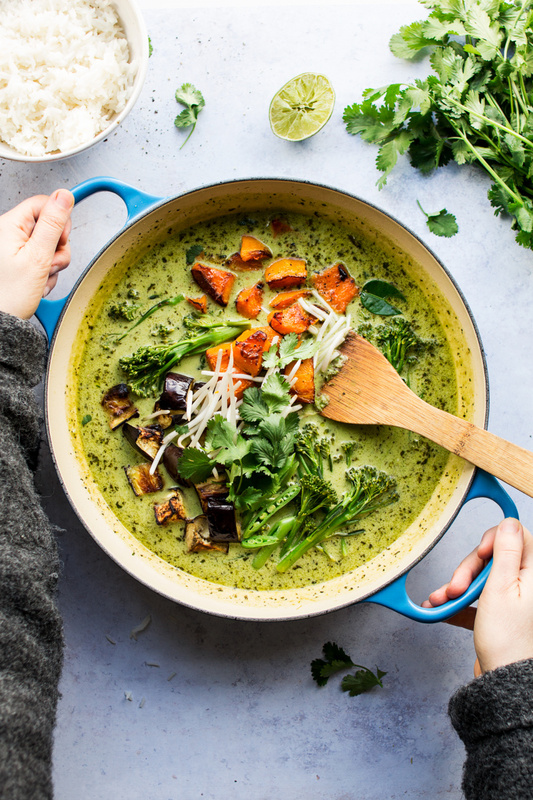 In terms of the veggies, you could simply cook them in the simmering curry, but that gives you less control over the ‘doneness’ of the individual elements and it affects the colour of the green veggies. I personally prefer to bake the butternut squash and aubergine in the oven and to steam the sugar snap peas and broccoli. I baked the butternut squash and aubergine in a 210° C / 410° F (190° C / 375° F with fan) oven for about 20 minutes (turning them once, after 10 minutes) after coating them in a bit of olive oil. I steamed my sugar snap peas for 2 minutes and tenderstem broccoli for 5 minutes. Serve on top of plain jasmine rice garnished with blanched bean sprouts and fresh coriander. *If you are unable to get hold of vegan fish sauce, you can add some ground up nori to the paste for extra umami. I grind my nori sheets in my spice grinder and incorporate them into foods that traditionally contain such animal products as shrimp paste or fish sauce. It works a treat.